I scream, you scream, we all seem to be screaming, “BALI!” Filled to the brim with incredible hotels, full body spa options that will beat the knots right out of your back, and stunning scenery that can only be found on this rugged Indonesian island, Bali is the ultimate destination getaway for anyone in need of a serious unwind, unplug, and reboot. 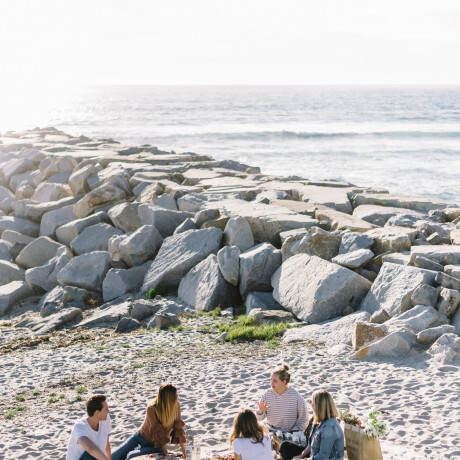 And since everyone we know could use a holiday of that variety, why not invite all your nearest and dearest to Bali and throw a wedding into the mix. Say whaaaaat! Destination wedding in Bali? Hold the phone. 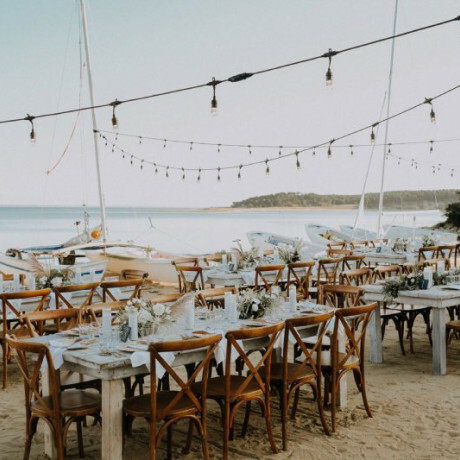 We’ve gathered all our favorite spots for a gorgeous Bali wedding into one list and we’re coming in hot with incredible luxury resorts, sleek architectural phenomena, tiny hideaways, and so so so many swimming pools overlooking that mysterious Indian Ocean. So take a peek, get inspired, and let us know if you make the plunge. 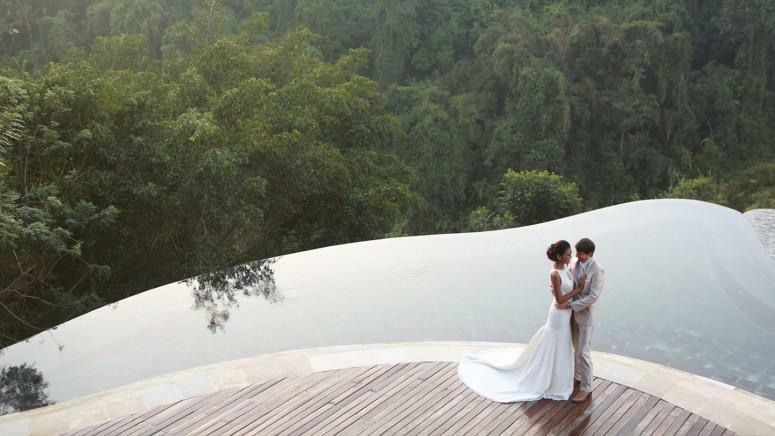 Make sure to also check out the rest of our top wedding venues in bali. Looking for elopment ideas outside of bali? 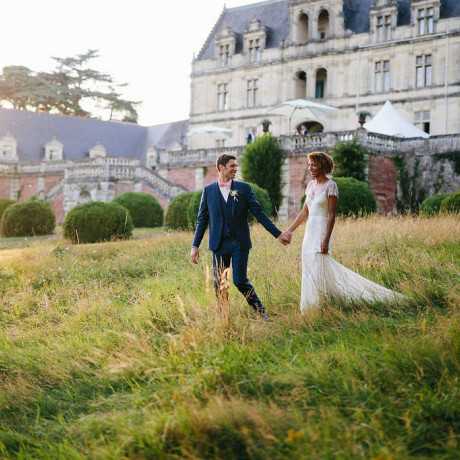 Don't forget to check out our lastest edition: 36 Jaw Dropping elopement ideas we love in 2017. Setting itself apart from the crowd as the gold standard of luxury, Bulgari Resort Bali seamlessly blends the exotic jungle with contemporary design. 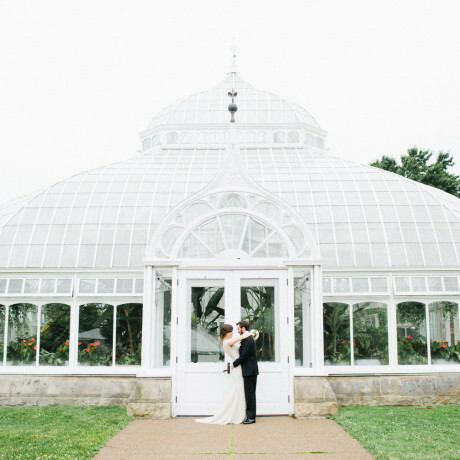 Tie the knot on a real life floating carpet (childhood dream, realized) or take to the brand new glass chapel for even more elegance. Impossible, we know. With villas, mansions, and restaurants galore, all you need to decide is whether your headed to the private beach or infinity pool. If you’re looking for a venue that’s a little more manicured and still very authentic to this incredible island, The Chedi Club might be your jam. 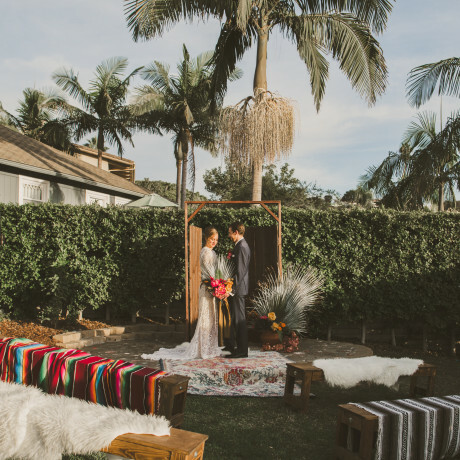 We can totally picture a surprise wedding taking place in the open-air bale dedari (think much cooler version of a gazebo), taking full advantage of the mountain views and surrounding tropical trees and plants. With stone elephants and Ganeshas sprinkled around the property, this spot has an undeniably romantic Indonesian feel. 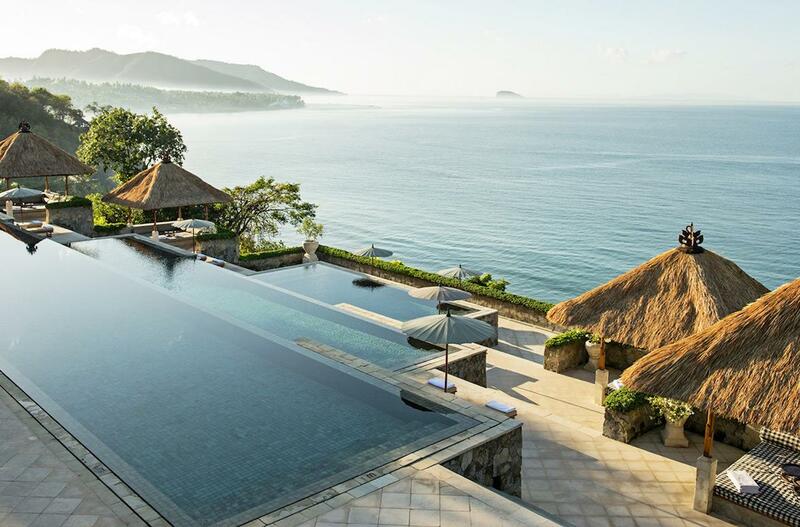 We’ll probably never get sick of infinity pools that drop off right into epic views of the tropics. So, keep ‘em coming, please! Hanging Gardens Ubud has exactly that vibe. With absolutely gorgeous views of the surrounding mountains, this amazing Bali wedding venue is peaceful, private, and totally luxurious. 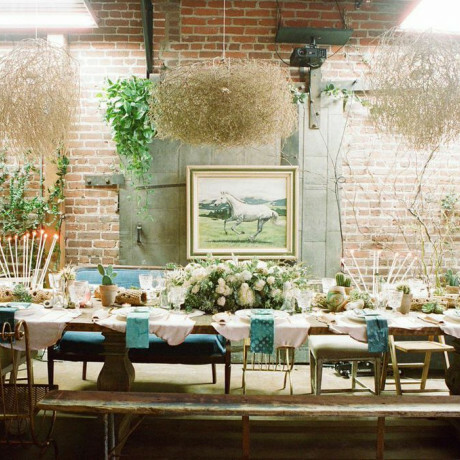 Perfect for a wedding of about fifty guests, this spot is a total dream. Synonymous with luxury, the Aman brand has come to be known for placing gorgeous architecture in sprawling beautiful locations. 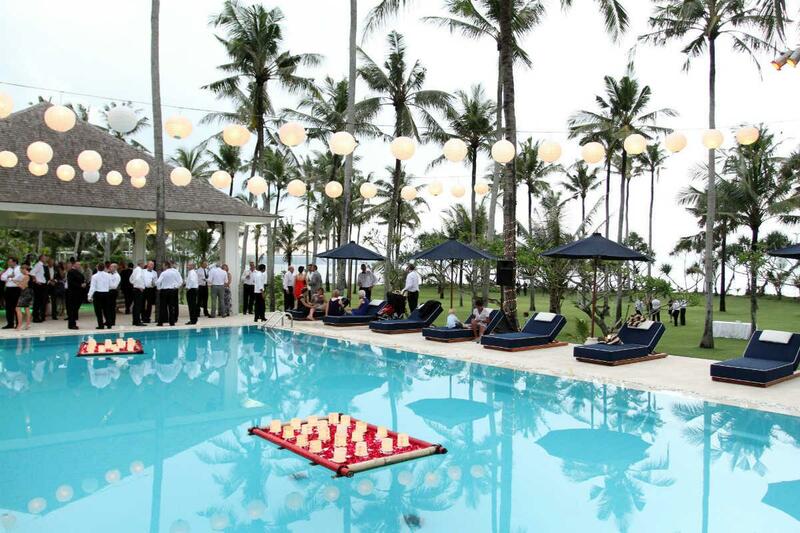 Amanusa Resort in the South Kuta region is one of Bali’s top destination wedding venues. Located at the tippy top of a monster cliff, the luxe accommodations here will have you swooning in no time. There are about 35 suites and an additional ten villas on the property, so it’s really the perfect size to take over with an entire wedding crew. If villa life is what you’re going for with your stay in Bali, you’ve absolutely got to check out Semara Luxury Villa Resort, which is so baller it even comes with your own butler. NBD. Nobody worry about us, we’ll just be hanging out in the epic infinity pool that sits Cliffside overlooking the ocean. 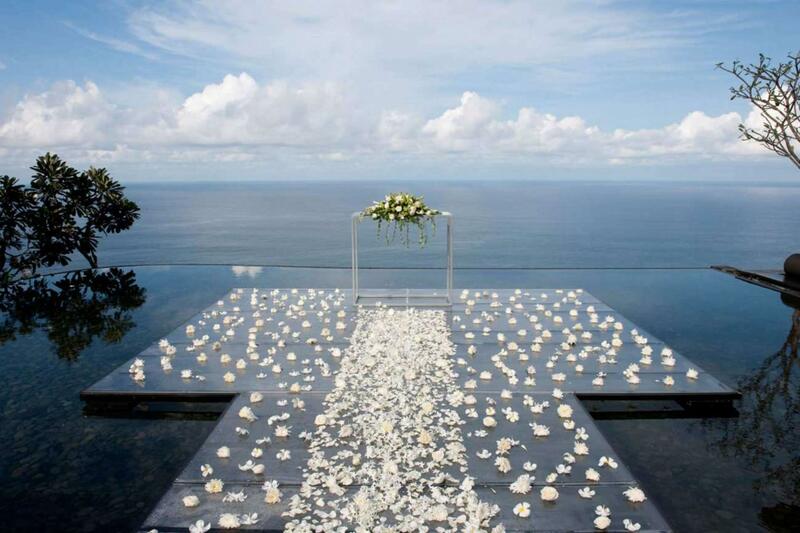 We can’t really imagine a more breathtaking place for a wedding in Bali. 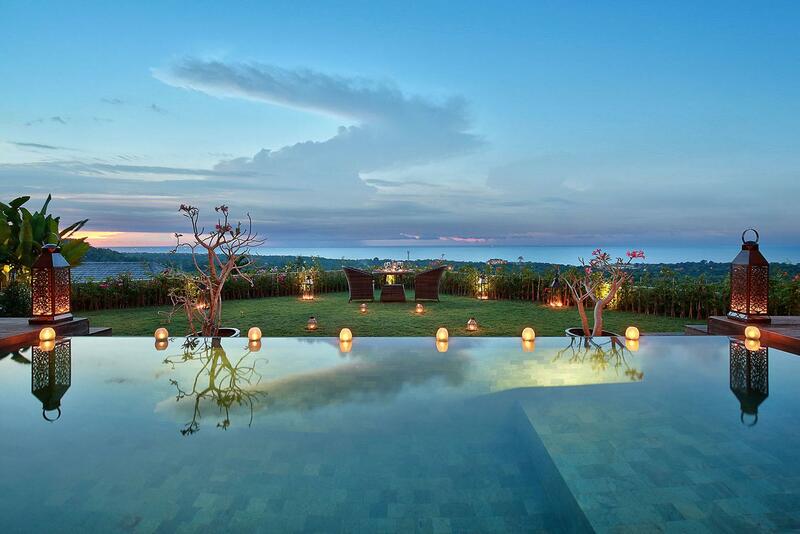 This gorgeous wedding venue and boutique hotel in Bali is set amongst the rice terraces and volcanic sand beaches. There are 65 rooms on-site, each with their own private pool, and accommodations are modern, cool, and totally luxurious. 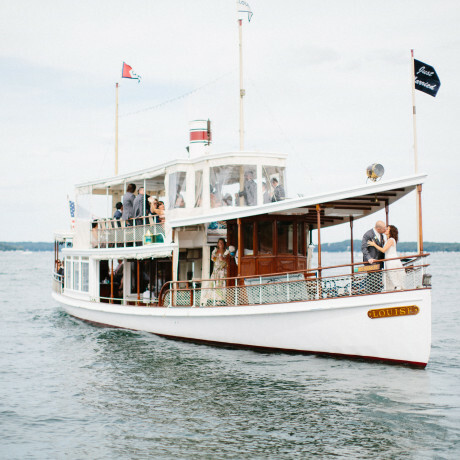 As for event spaces, there’s an incredible structure that floats just above the cliffs and gives a gorgeous view of the surrounding landscape, and there are plenty of outdoor options for couples too. Maybe it’s the playful colors, or maybe it’s the contemporary look of this spot, but Luna2 has an almost Palm Springs aesthetic. A cool, modern boutique hotel in Bali that’s a bit lesser known, this private estate wedding venue can accommodate up to ten with sleeping arrangements. The beachfront garden is an awesome option for a wedding on the coast. Southern Bali boasts a stunning landscape of rugged cliffs with incredible Indian Ocean views. 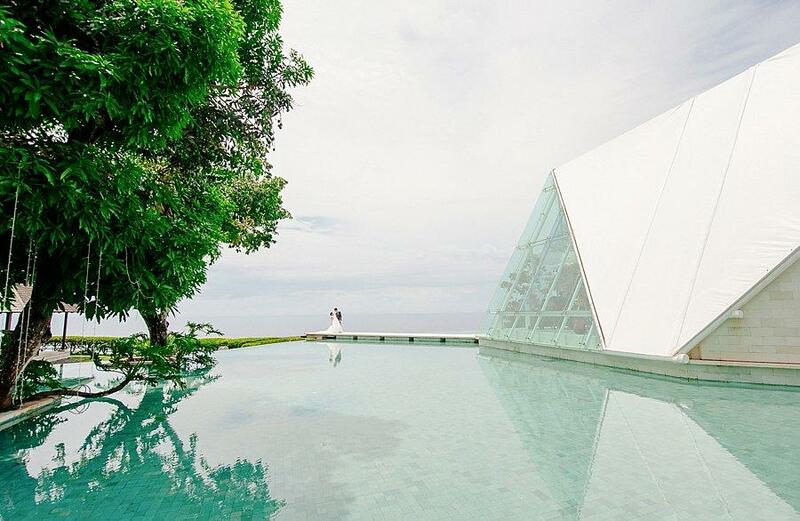 Set atop those cliffs is Tirtha Bridal, a modern wedding venue in Bali that’s an architect’s dream. 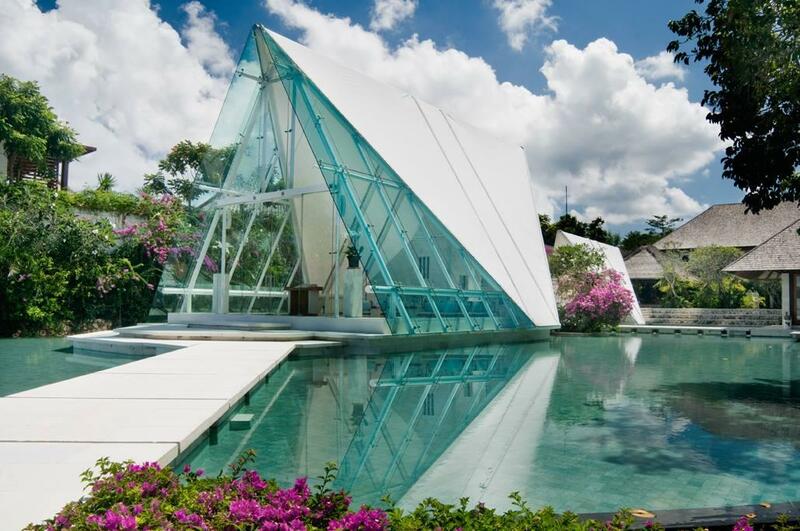 This huge white glass chapel serves as a breathtaking backdrop for a wedding, while multiple additional spaces on-site serve as more traditional Balinese open-air event spaces with thatched roofs. 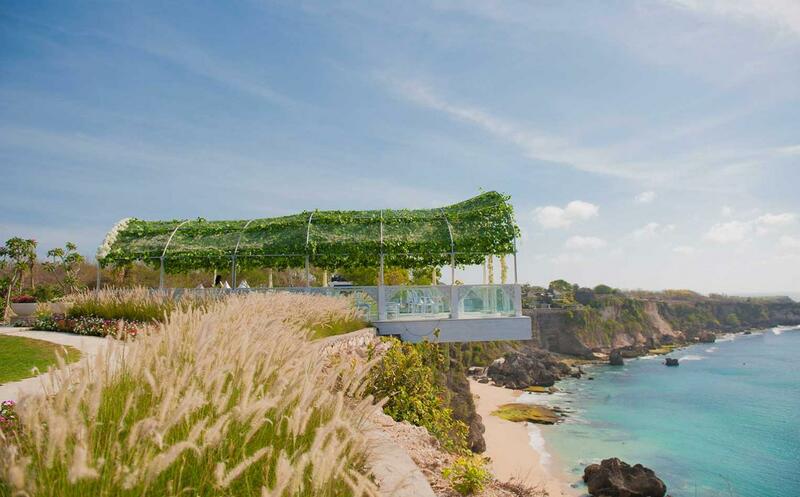 A glass walled chapel rests at the cliff’s edge at this breathtaking Bali wedding venue. Ayana is a sprawling resort with 15 restaurants and bars, 11 swimming pools, and one of the best spas on the island. 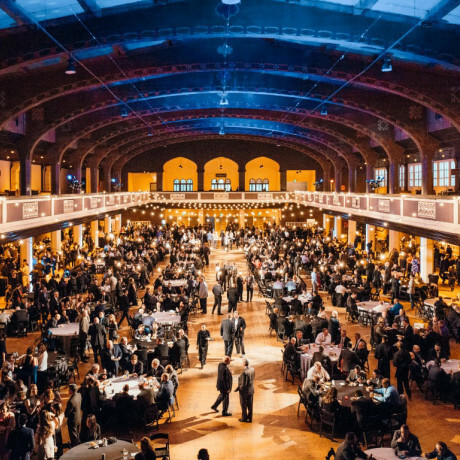 With lots of event space options, you could easily build a weekend agenda with a surprise location every single night. 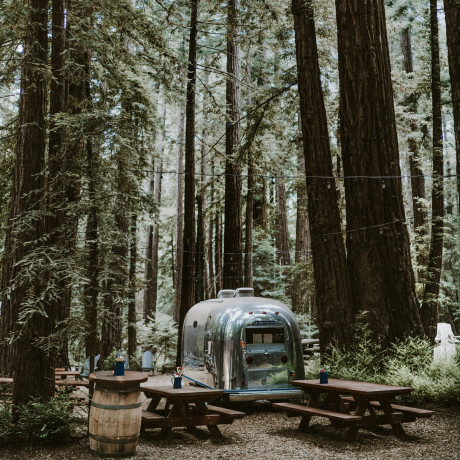 Plus, if you’d prefer to be indoors rather than out, you can still get the beautiful water views without getting sand in your dressy shoes. 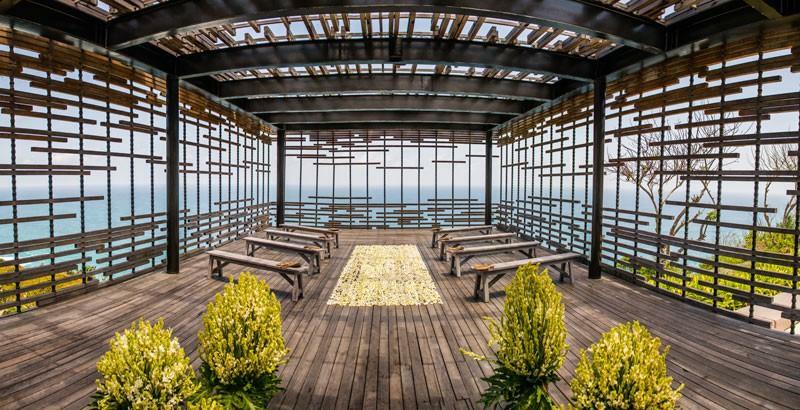 Here’s a spot that’ll fit a wedding of up to 100 in Bali. 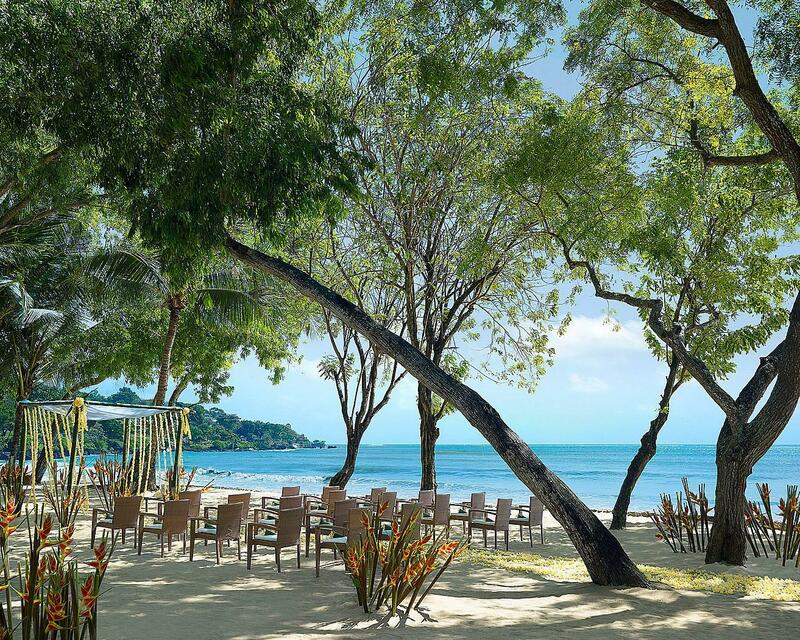 Four Seasons Resort at Jimbaran is equipped with an oceanfront pavilion that’ll knock your socks off. 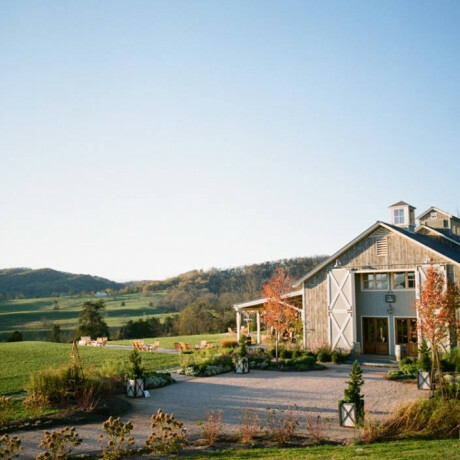 With an additional 35 acres, you can bet there are quite a few additional outdoor wedding options too. Best part is that this resort has almost 150 rooms on-site, so there are plenty of options for even the pickiest of guests. 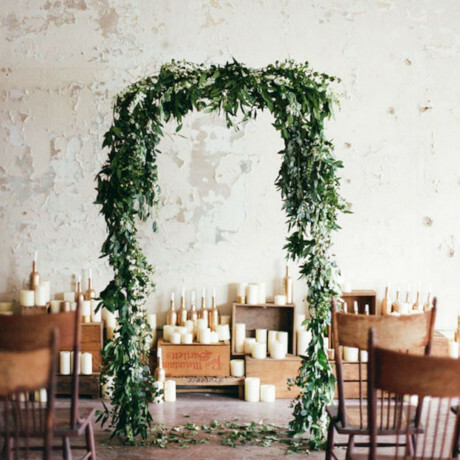 Delicate white pennants line a path leading to a bamboo arch decorated with young coconut leaves. Flowers and delicate drapes of white fabric create a magical and romantic atmosphere at an Amankila Balinese wedding. Frangipani, tuberoses, white orchids, chrysanthemums and gardenia adorn the dinner tables, whilst a Balinese traditional dance is performed to a gamelan orchestra. Sink your toes in the volcanic sand at one of these incredible luxury villas. 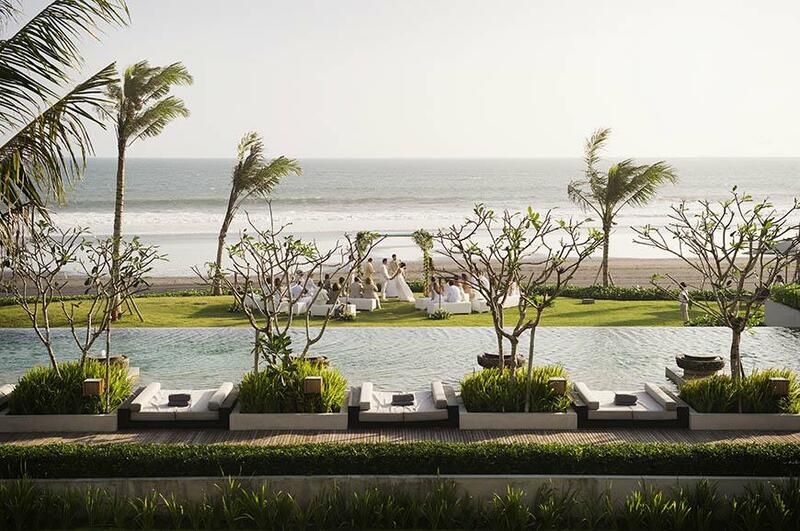 Easily one of the best wedding venues in Bali, Alila Villas Soori is a sprawling estate comprised of multiple villa and residence options with more indoor and outdoor pools than we can count. 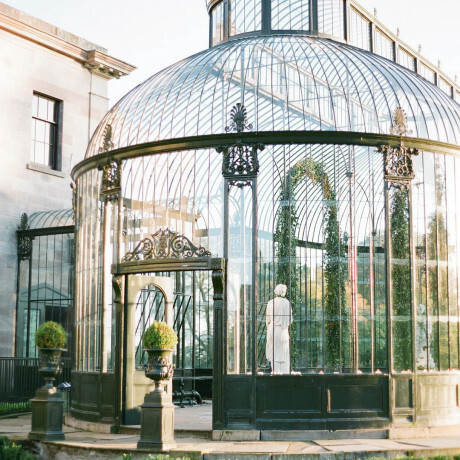 If incredible architecture is at the top of your wedding goals list, this could be the spot for your big day. 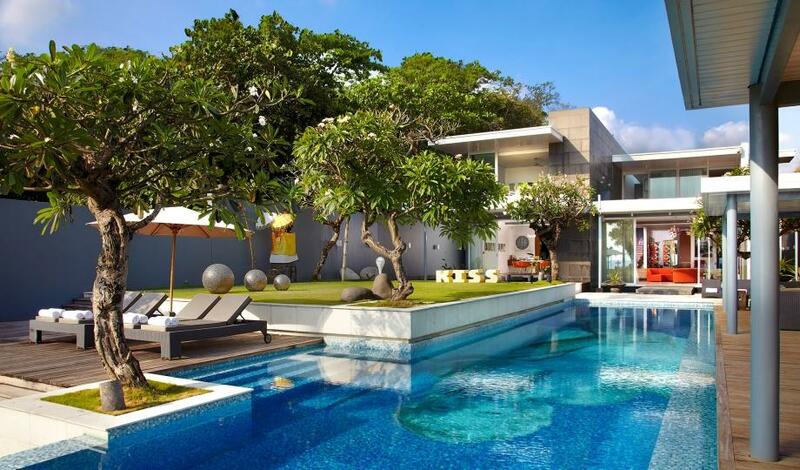 A seven-bedroom mansion, Villa Gajah Putih sits in the middle of a coconut grove right on the beachfront. Easily one of Bali’s best private estates, there’s a home cinema and about twenty people on staff. With modern rooms like this in a paradise setting, you’ll probably never want to leave. Maybe one of the staff can send for your things from home. This trio of luxury Bali resorts features some of the most high-end accommodation options and event spaces on the island. 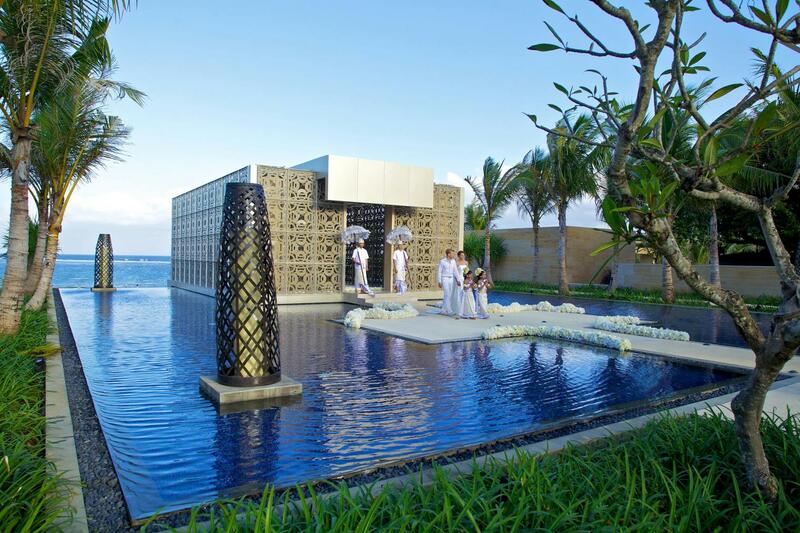 A massive property with three sanctuaries, multiple ballrooms, over 700 sleeping spaces, and all in five-star glory, Mulia Mulia is all about ensuring you have the best possible experience Bali has to offer. Another awesome Four Seasons resort in Bali, the Sayan resort has more of a wild, jungle vibe than its counterpart at Jimbaran. With 60 villas and suites on the grounds, this spot is tucked away but not so secluded that you feel like the only people on the planet. 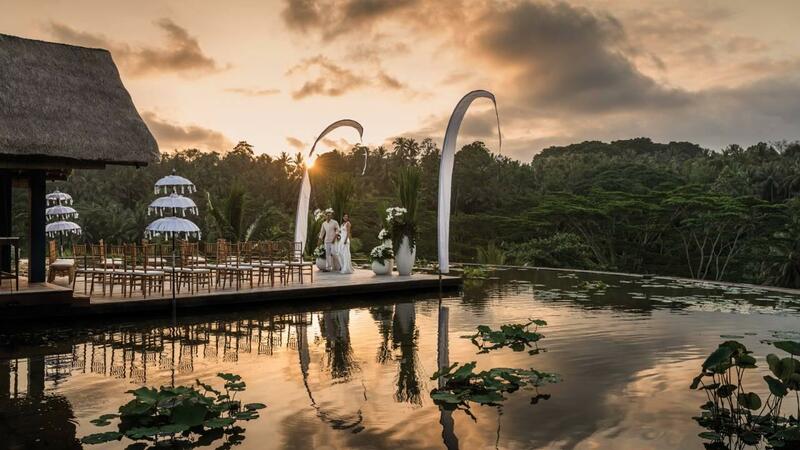 Wedding options here include dining at the edge of the Ayung River, a royal villa surrounded by lush gardens and tropical flowers, and a sweet little lotus pond. Epic resort life beckons from this top-of-the-hill estate that has ocean views from basically everywhere you stand. Six multi-room villas make up Hidden Hills, each with its own cool factor. 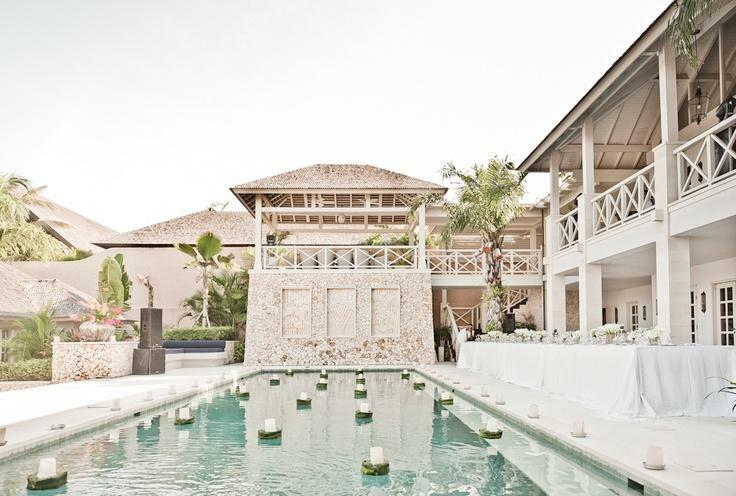 Weddings here can accommodate up to 150 in a combo of indoor and outdoor spaces, and of course, multiple poolside options.